Guys, some of these are just plain offensive. 1. This coffee-flavoured chardonnay which doesn't even sound good in theory. 2. This bowl of Spam and Cheerios which doesn't even have MILK?! 3. This cheese and strawberry pizza which is besmirching the good name of pizza. 4. And this one with banana, cheese, mushrooms, peanuts, and curry powder. 5. These ham-wrapped bananas which make absolutely no sense to me. 6. This peanut butter and jelly sandwich with Flaming Hot Cheeto puffs which will get stuck to the roof of your mouth AND get stuck in your teeth. 7. This cheesy cereal bowl which isn't even made with good cheese OR good cereal. 8. This hot dog salad with strawberry vinaigrette which sounds truly horrendous. 9. This unique ice cream flavour which is truly an unholy shade of green. 10. This milk-filled bowl of cheddar crackers which makes me want to cry. 11. And Cheetos with milk which is somehow even worse. 12. This bowl of popcorn and mustard, finished off with cracked pepper of course. 13. This cherry tomato topped with Nutella which makes me wanna barf. 14. And this big ol' plate of curry, ham, and chips, finished off with a dollop of Nutella. 15. This onion ring dipped in powdered sugar which makes me wonder what's wrong with just eating a normal doughnut? 16. This tuna and peanut butter sandwhich which is making me want to abandon my taste buds forever. 17. And this bowl of tuna, cottage cheese, and raisins, which has me gagging until the end of time. 18. This cheese pizza topped with honey which is making my tastebuds tingle just thinking about it. 19. This sandwich filling which is making me weep for humanity. 20. This soy sauce drizzled on ice cream which is just plain offensive. 21. These Hot Cheetos marshmallow bars which look like the worst Halloween treats ever made. 22. This mayo, PB, and lettuce sandwich which would have a great texture but horrendous taste. 23. This ramen sandwich which SURELY can't be tastier than just normal bread? 24. 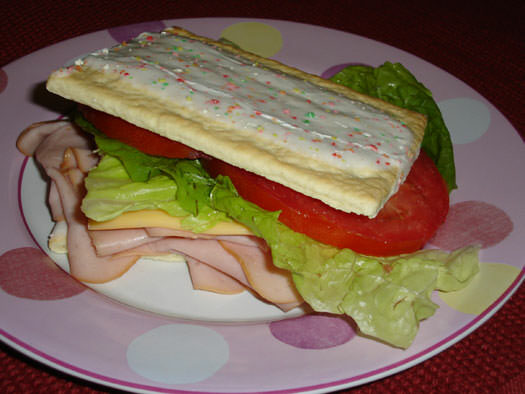 And this turkey sandwich which looks delicious EXCEPT THE BREAD IS POP-TARTS.